I don’t think guys will truly ever understand the joys of slipping on a maxi dress in the summer – the weightless material feels ultra breezy, even though you’re wearing a full-length skirt, while the bold use of prints and colours allows you to take a break from the everyday in your wardrobe. You can dress ’em up with accessories and delicate sandals or make ’em casual with a jean jacket or raffia hat. And bonus points for getting to skip shaving your legs for a day. As my husband can attest, I am on the hunt for a few great maxis this summer. The list of my currently coveted maxi dresses I could have shared with you today would have taken years to compile because there are so many great options, but I figured I’d at least point you in a few great directions for where to shop for your summery maxi. Eliza J Print Chiffon Maxi Dress – $179 @ Nordstrom: This Canuck-friendly retailer shows Canadian prices, including duty, so there’s no surprises when your gown arrives. The Eliza J brand I plucked this dress from has a half-dozen or so beautiful floral printed maxis that would make great picks for wedding guests. Icone Paisley Print Maxi Dress – $78 @ Simon’s: Based in Quebec, this Canadian retailer has a good range of affordable Maxis, from $30! I adore this mid-priced option, with a hippie-esque paisely print that would look swell with a beaded necklace or denim jacket. Feather Paisley Maxi Dress – $178 @ J Crew: The J Crew lineup of maxis is great for achieving that effortless, beachy style – primarily in simple stripes and bold panels of colour. And yet it was this cornflower blue number that stood out, in part for its kaleidoscopic dashes of summery pink and yellow. Capay Dress – $168 @ Anthropologie: If you’re going to splurge on a maxi, there’s really no better place to do it. Anthro has some breathtaking fabrics and cuts, but I adore the simplicity of this colour blocked hi-low dress, in sorbet-inspired peach, cream and blue. Twelfth Street by Cynthia Vincent Contrast Maxi – $263 @ Revolve: Willing to go designer? 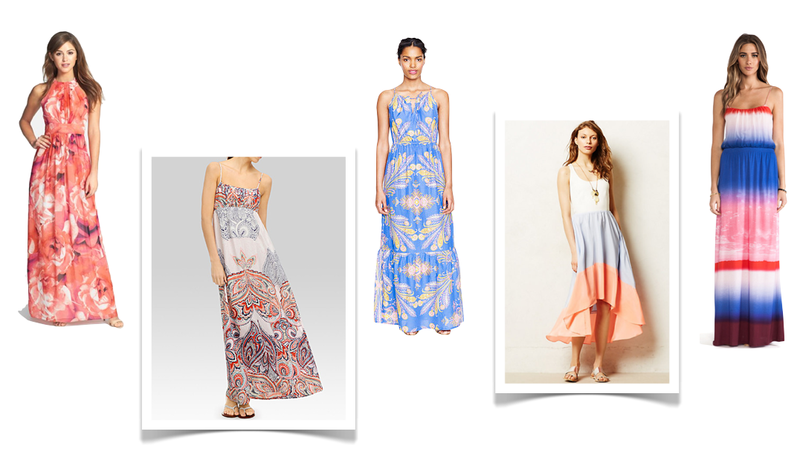 Revolve has a mind-blowing selection of maxi dresses. I love the bold pairing of colours here, reminiscent of a ‘Rocket’ Popsicle, as well as the subtle sky / ocean pattern at the mid-point of the skirt. Whether or not you like any of these dresses, consider investing in a maxi – they’re fun, floaty and oh-so-easy to throw on, even in the sweltering heat. If you want a bonus entry into my ‘Natural Beauty Secrets’ post from yesterday, tell me in the comments below: which of these dresses, if any, would you buy (or gift)? If you don’t love any of ’em, click on the links above to get to the retailers and tell me what *other* gown has caught your eye. Never thought myself to be a maxi person.. but finally mind wants it.. I like the Icone Paisley Print Maxi Dress! I love the Eliza J Print Chiffon Maxi Dress! I love the Twelfth Street but I don’t see myself splurging on this dress. I like the last two but I’m quite petite so maxis usually are too long and overwhelm me! that first dress is really nice!! I love the Capay dress, those colours are amazing! I love the “Contemporatine” mixed fabric maxi dress from Simons. I like the Eliza J chiffon dress. I would love to wear the Paisley print dress! It’s so cute! i like the capay dress’ hi-low! I like the first dress, the Eliza J.